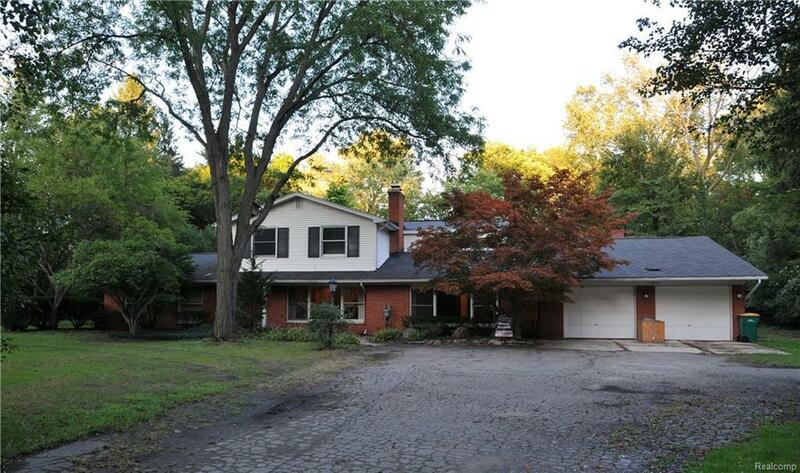 This is a rare opportunity to own 2 acres in Farmington Hills! Idyllic private park like setting w/mature trees. Enjoy the wildlife in your own ‘up north’ backyard! This beautiful 3 bedroom 3-1/2 bath home features a formal living room, dining room, great room, library, office/den, kitchen, 3-season sunroom, mud room & laundry room. Master bedroom suite is almost 700 sqft & includes sitting room loft overlooking the great room, master bath & large walk-in closet. 1st floor bedroom features a wall of closets & the 2nd floor bedroom features a walk-in closet along w/a 2nd large closet. Large walk-in closet in the foyer. Eat-in kitchen includes all appliances & has a walk-in pantry. Great room is almost 500 sqft w/soaring vaulted ceiling, brick feature wall w/natural fireplace & new carpeting. Large den features built-in shelving & new carpet. Dining room w/doorwall to 3-season sunroom & huge deck. Office/den features a brick gas fireplace. Heated workshop in attached 2-1/2 car garage.